Relative permeability is one of the most important properties influencing the fate and movement of CO2 in the subsurface. It is a parameter that quantifies the extent to which the injected CO2 and water interfere with each other as they migrate through rocks. 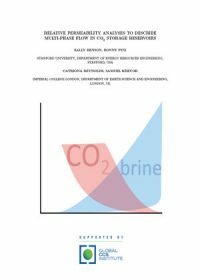 Relative permeability measurements are also used directly in all of the mathematical approaches for predicting and matching the fate and movement of CO2 in the subsurface. Consequently, accurate measurements for this important parameter are indispensable. The purpose of this report is to provide an explanation of the different methods used to measure relative permeability and to provide an objective review of comparable methodologies. The report will also include the identification of data gaps and the requirements to obtain additional material to provide a complete library of relative permeability measurements in varying brine compositions and rock types to represent as complete a suite of potential storage sites as possible. This paper describes efforts to characterise and model geological fracture networks at the In Salah geologic carbon sequestration (GCS) project in Algeria. The work explores the connection between fractures and percolation, and the likelihood of leakage during and post injection. This paper presents information by the Joint Industry Project established to monitor CO2 storage at the In Salah geologic carbon sequestration (GCS) project in Algeria. Satellite-based interferometry (InSAR) technology detected surface uplift over all three horizontal CO2 injection wells shortly after the start of CO2 injection. Imperial College London carried out simulations of CO2 injection aiming to gain a better understanding of the reservoir behaviour. The findings are reported in this paper.